Robin Hood is a part myth and part legend – a romantic figure who has evolved over the centuries since Robin Hood first appeared in popular ballads. 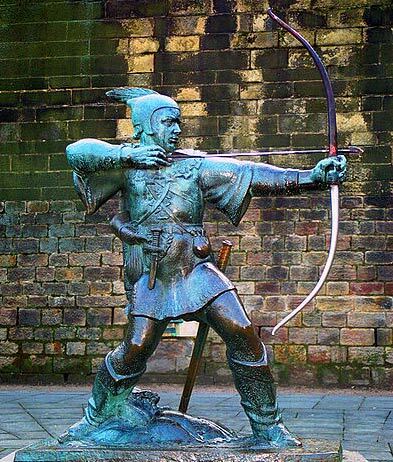 The traditional view of Robin Hood suggests he was an outlaw who fought injustice and helped the poor. In later versions, he was seen as loyal to the rightful king – King Richard III. 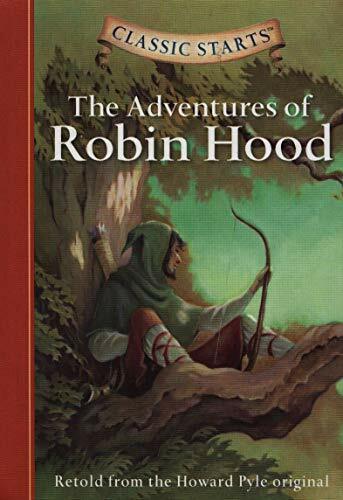 It is hard to ascertain any exact biographical information because the legend of Robin Hood has been evolving – ever since it first appeared in oral tales and the written word. To write a biographical account of the historical Robin Hood would be difficult because so little primary evidence exists. Most of the early sources tend to be ballads which were later written down. Ballads were often about real historical facts, but it is becomes challenging to be certain what is true and what is a legend. Popular legend associates Robin Hood with Sherwood Forest in Nottinghamshire. However, earlier ballads and sources suggest that he was based in Barnsdale, South Yorkshire on the borders of Nottinghamshire. Another tradition places Robin Hood in Loxley, Sheffield in South Yorkshire. In an Eighteenth Century version of Robin Hood’s death, he is said to have been buried in Kirklees Priory near Leeds in West Yorkshire, though this is likely to be wishful thinking. In early ballads about Robin Hood, Robin Hood is depicted as a yeoman/commoner who fights the injustice of the ruling aristocrats. He is described as a fearless leader, who seeks to right wrongs and, in particular, stand up for women. Interestingly, he is depicted as being hostile to the ruling Church hierarchy but with devotion to the Virgin Mary and the Mother aspect of God. In early tales, there is no mention of his partner wife/Maid Marian. In one of the earliest written tales of Robin Hood, Scotichronicon, there is a story of how Robin refused to flee from the sheriff’s men because he was attending mass in the forest. However, he was still able to defeat the Sheriff’s men – an apparent reward for his piety. However, in some of these early ballads, Robin is portrayed as a more fallible man, with a quick temper. For example, assaulting Little John, after Little John beat him in an archery competition. The setting of these early ballads such as Piers Plowman (c.1362 – 1386) places Robin Hood in the thirteenth or fourteenth century. This wouldn’t make him a supporter of the ‘rightful king’ – the absent Richard the Lionheart (in the Twelfth Century). Though they do mention his long-standing antipathy to the Sheriff of Nottingham, who wielded much power over the people. In the 16th Century, plays by Anthony Munday presented Robin Hood as a noble who had been wrongfully dispossessed of his land. This may have been to make Robin Hood more attractive to the aristocrats who were viewing the play. This view of Robin as a real aristocrat has become established in recent media depictions of Robin Hood. Over the centuries, other characters have also been woven into the Robin Hood legend. This has included the romance of Robin and Marian. The ‘jolly friar’ Friar Tuck and Will Scarlett. In the Nineteenth century, an influential work was Howard Pyle’s The Merry Adventures of Robin Hood. This emphasised Robin Hood’s role as a philanthropist who robbed from the rich and unjust and gave to the poor. Perhaps a role model for the Victorian philanthropist. In these accounts, there is passing mention of Robin Hood’s loyalty to King Richard. The 1938 film, The Adventures of Robin Hood, starring Errol Flynn, portrayed Robin as a hero leading the Saxons in revolt against their Norman landlords. This film played a key role in cementing a certain idea of Robin Hood for a considerable time. 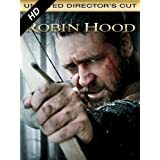 In recent film versions such as Russell Crowe’s Robin Hood (2010), Robin Hood was portrayed as noble unfairly cheated of his lands. He returns to England after fighting in France to find he is actually the rightful heir. Citation: Pettinger, Tejvan. “Biography of Robin Hood” Oxford, UK. www.biographyonline.net. Published: 26th Nov. 2010. Updated 10th February 2017. Robin Hood – fact or fiction?